Every one loved them. Would recommend for any baby shower. Q:Can I have it without ribbon? So I can arrange it in away for a baby boy? A:The ribbon is part of the standard packaging. Q:Can I get it in blue polka dot? A:These shakers only come with the pink polka dot, cannot change to blue polka dot pattern. A:This item is only available in the colors as shown. 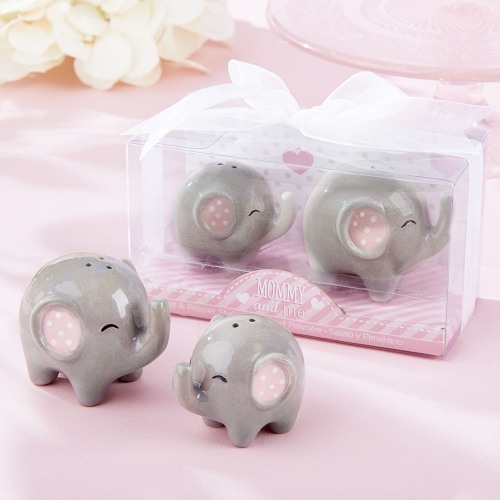 This adorable "mommy and me" elephants salt & pepper set will surely win over guests at the baby shower! Each set comes with two ceramic elephants, mommy and baby. Each set comes in a clear-topped favor box, ready for gifting!